The Board is accepting proposed changes to the subsistence, personal use, sport, guided sport, and commercial fishing regulations for Lower and Upper Cook Inlet Finfish, Kodiak Finfish, and Statewide (except Southeast and Yakutat) King and Tanner crab general provisions. The board may also consider subsistence proposals for other topics (including other areas) under the subsistence proposal policy, 5 AAC 96.615, if proposals are submitted within this deadline and the board determines they meet the criteria in either 5 AAC 96.615(a)(1) or (2). If the calendar doesn't display, trying using incognito mode, clearing your cache and cookies, or a different browser. The Board of Fisheries provides notices for meetings, regulatory changes, proposals, and calls for proposals electronically. Sign up to receive e-mails on your areas and regions of interest. To request information by hard copy, please contact us at (907) 465-4110. The Alaska Board of Fisheries consists of seven members serving three-year terms. Members are appointed by the governor and confirmed by the legislature. Members are appointed on the basis of interest in public affairs, good judgment, knowledge, and ability in the field of action of the board, with a view to providing diversity of interest and points of view in the membership (see Alaska Statute 16.05.221). The Board of Fisheries's main role is to conserve and develop the fishery resources of the state. This involves setting seasons, bag limits, methods and means for the state's subsistence, commercial, sport, guided sport, and personal use fisheries, and it also involves setting policy and direction for the management of the state's fishery resources. The board is charged with making allocative decisions, and the department is responsible for management based on those decisions. The board has a three-year meeting cycle (PDF 147 kB), and generally holds meetings from October through March. The Board of Fisheries meets four to six times per year in communities around the state to consider proposed changes to fisheries regulations. 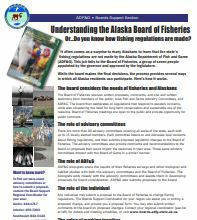 The board uses biological and socioeconomic information provided by the Alaska Department of Fish and Game, public comment received from people inside and outside of the state, and guidance from the Alaska Department of Public Safety and Alaska Department of Law when creating regulations that are sound and enforceable. The Board of Fisheries is established under Alaska Statute 16.05.221 for the purposes of the conservation and development of the fisheries resources of the state. The Board of Fisheries has the authority to adopt regulations described in AS 16.05.251 including: establishing open and closed seasons and areas for taking fish; setting quotas, bag limits, harvest levels and limitations for taking fish; and establishing the methods and means for the taking of fish. The regulations the Board of Fisheries has authority over are 5 AAC Chapters 1- 77. Contact the Boards Support main office at (907) 465-4110, or see detailed contact information.